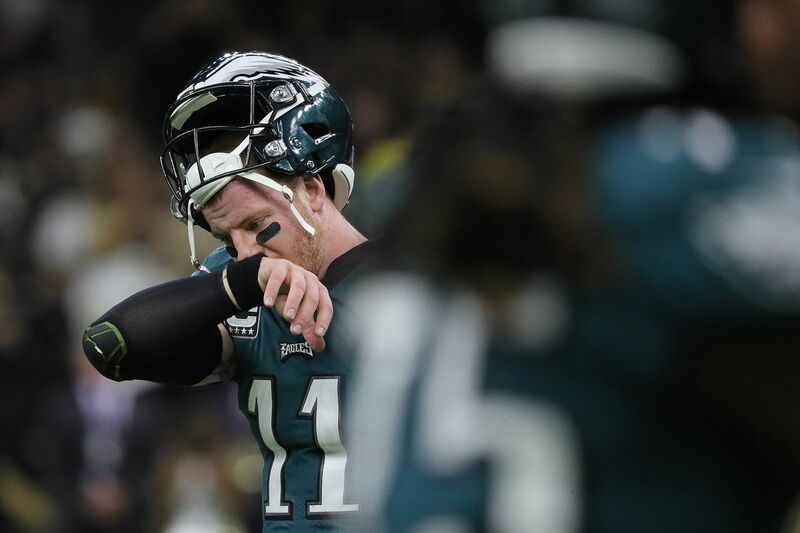 It was a bad loss for Carson Wentz and the Eagles, but it was only one loss. NEW ORLEANS — When the NFL issued the regular-season schedule in April, and the parlor game of assigning wins and losses to each of the 16 games began in earnest, even the most optimistic of Eagles fans looked at Sunday's matchup in New Orleans as a pretty tough spot. Mark it with an "L."
As it turned out, it was an L of an L. There's nothing else to call the 48-7 rump roasting that took place in the Superdome. Aside from a safe and successful bus ride to the stadium, not much went right for the Eagles. They were outmanned, outclassed, outplayed, and out of the game quicker than you can say, "Brees drops back to pass." But it was one loss. Maybe it should have counted as two, or even three, but it went down as just one. And it was a loss that has been expected for at least six months. Nothing about the outcome itself was a surprise. When the Eagles were still the unsullied Super Bowl champions, they were supposed to drop this one. Well, hoo boy, did they ever, and while the margin of defeat magnifies the disappointment, it changes nothing about their prospects this season. The NFC East is still an easy division to win, and it got easier on Sunday when the Redskins lost quarterback Alex Smith. The Eagles aren't really in it yet, but they aren't out of it, either. Their next three games — versus the Redskins and Giants, and at the Cowboys – are all division games. If they can sweep those three (work with me here), and come out the other side with a 7-6 record, anything is still possible. Anything. It will take some luck, and some healing, but assuming that the season is over after a loss is the same thing as assuming the season is saved after a win. Admittedly, losing by 41 points doesn't do much for one's perspective, but the math can work if the Eagles do the same. "We have to try to win a division game this week, and I believe in us. That's no B.S.," defensive end Chris Long said. "I want to mope. I want to throw [stuff], but that's not going to do us any good. We're 4-6. That's what we are. All we can do is focus on the one thing that's in front of our face, and that's the division game coming up. Just one. Just win one game, and we can't worry about the past, or last year. We just worry about right now." Let's say the Eagles find a way to win those games, while Washington loses on the road to Dallas and the Eagles, but beats the Giants; and while Dallas beats Washington, but loses to New Orleans and the Eagles. That puts the Eagles in a 7-6 tie with the Redskins, holding the tiebreaker, and the Cowboys at 6-7. Get there and you like the Eagles' chances, because getting there will mean they are playing football again. If they can't get there, against three flawed opponents, it would mean that the Saints didn't just take their lunch, but took the heart out of them, too. "There's always that fear," coach Doug Pederson said, "but I didn't sense that with our group. We're in a rough spot right here, but I believe in those players, believe in those coaches." Carson Wentz gets turned end-over-end by Saints’ defensive end Cameron Jordan. Again, Sunday was not a confidence-builder for that belief, and the sheer weight of the injuries the team is carrying is a crusher. Having three more defensive backs leave the game either for periods of play or for the duration – Avonte Maddox, Sidney Jones, and Rasul Douglas – would have put the Eagles in a difficult position against any quarterback. Against Brees, it bordered on unfair. Carson Wentz also had a tough day, but the Saints' knew he had to throw the ball, and took advantage. Once the snowball started rolling downhill, nothing could have stopped it. Now, it becomes a question of character, a question that the core of this team answered last December when Wentz tore up his left knee. "I know these guys and we're going to go down fighting," tight end Zach Ertz said. "We've got four division games left. We have to focus on each and every day. Not seven weeks from now. Each and every day. We'll continue to fight. It's the only way." They will need a few breaks, of course, and they are due for those. Mostly, it will be about getting some guys back from injury. Not all of them, but a few. Hopefully, the experience gained by the reserves during this bad stretch will pay off, too. It can happen, and it can happen a lot easier in the NFC East than in any other division in the NFL. They still have that going for them. That and the promise of the next three weeks. "I want to remember this," offensive tackle Lane Johnson said. "When you get kicked in the face like we did, it makes you look at yourself. I hope it burns. I hope it hurts all of us, because I don't want to be part of this again." And with that, we rejoin the portion of the schedule where everyone returned to writing W's. We'll see if they were right. They sure didn't miss the New Orleans prediction.